Poor Mojo's Classic Squid: Squid "Ask The Giant Squid: The Giant Squid presents MonkeyZen, grouping the first, item one of three "
For the benefit of the comically and/or visual impaired, I shall play-by-play the above comical portraiture. It is very comical. Do not pause, for you shall miss the humorous conclusion. 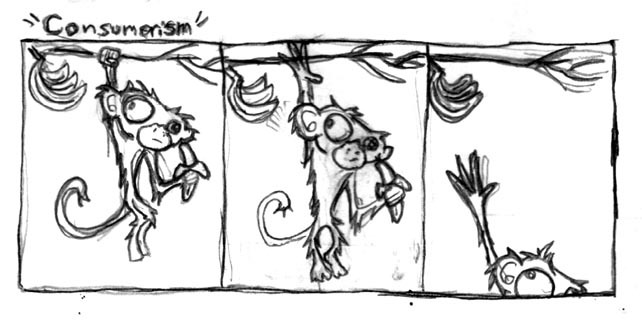 Panel the First: MonkeyZen, a monkey, hangs from a tree, suspended from his rightmost manipulator. In his leftern manipulator he holds a delicious banana (mmmm... rich and sultry potassium, how you tempt even the greatest of us to our doom). To his right, dangling precariously from the branch from which MonkeyZen himself precariously dangles, is a beautiful bunch of ripe bananas. Botanical resource indicate that this diagram of growing bananas is, at best, allegorical. Panel the Second: MonkeyZen, eyeing the beautiful bunch of ripe and allegorical bananas, releases his hearty righthanded grip of the branch from which he dangles. The left manipulator still grips the much-beloved banana upon which he snacks. Panel the Third: MonkeyZen is falling from his treeperch at an enormous rate of acceleration, yet still reaching out with the rightmost hand toward the much-sought-after beautiful bunch if unrealistically-though-clearly-allegorically-significantly illustrated bananas. Although the left hand is not within the frame-of-view, one must presume it still clutches the delicious banana-in-the-hand, already acquired before the start of this tiny playformance. Although I am no great student of the literary arts of you surface sorts— nor, truth be told a great admirer of said arts . . . and, if the truth is to be fully revealed, am generally loath to use the word "arts" so casually although I grant that such concerns are neither in the here nor in the there— I will nonethelesser endeavor to shed some lighting into the possible significations of this three part passion play of primates and comestibles. Brief Interpretation: In nature, the noble banana— a social fruit— grow in symmetrical, spindleformed bunches pointing upward, not scythelike curls pointing sideward. We thus see that even the benevolent banana— here representing all of Frauline Naturlink's Glorious and Nurturing Bounty— opposes MonkeyZen in his every maneuver. Similarly, it is to note that MonkeyZen grips his captured banana within the leftmost hand, that same hand which Cain used to slay his brother Abel. We also bear to mind that while Abel was a sheep-herd, and thus brought close-to-breast by your slavering Blood-God of the Older Testament, Cain was a simple fruit-herd, and shunned by that same frigid, fickle Godhead. As such, we can see that MonkeyZen's plight— to be abandoned both by God and Nature— is the plight of you all. Do not all primates— having ventured so far from the sea's salty embrace— wander much far East of Eden, in the land of Nod? Allegorically speaking, at any rate? Your's is not like the lives of those jolly giant pig-dogs, the cetaceans, smart enough to go to land and then return seaward— where, of tangential interest, they were slaughtered by slump-chimps like yourselves in order to make sweet-stinky colognes, mediocre night lamps and women's underthings for the full-figured miss. Curious, your deathward tendings. Reflect upon that; it might benefit you greatly.